Everything you will want to know if you find you have the BRCA gene mutation that increases the risk of various types of cancer, to enable you to make a decision about how best to move the odds in your favour. The most amazing book on the market!!!!!!! In this amazing book Clarissa has offered a heartfelt personal account and an incredibly informative scientific explanation of the BRCA journey. Such a book is life changing for those affected by BRCA! This book is a ‘must read’ for anyone facing the difficult choices Clarissa had to make. I also think that health professionals would benefit from reading what it feels like to experience this from a patient’s point of view. I can’t recommend it highly enough. Great book for those who want to learn about BRCA and other mutations. A wonderful read on a personal level and also really informative about BRCA and the risks that come along work being a mutant. This book is well researched and invaluable to any person needing info about brca. The book could possibly be life-changing. Such a selfless act in wanting to help so many other people. Clarissa is a truly incredible lady who so deserves to win this prize. A BRCA book written by someone who has bared their personal life experience in hope to help others. Faced with hard decision whilst trying to ensure no stone is left unturned in order to make an informed choice about the BRCA surgery. Science explained in a way that is easy to understand. A truely fantastic book that I believe will help so many people understand BRCA. This is a truly fantastic book and I thoroughly recommend it. This book undoubtedly contains the most complete analysis of BRCA related medical studies ever collated. Further enriched by Clarissa’s own open, honest and inspirational journey, making this book a must have for anyone affected by BRCA, their family’s and those dealing with BRCA in a professional capacity. This is an amazing, life-altering resource for those who need it. Well done Clarissa! An amazing and very readable and well researched book. Helped me a lot when I found I have this mutation to understand its implications and make decisions as to how to manage it. Highly recommended. This book is a MUST READ for anyone that is, or thinks they might be, at an increased risk of cancer due to a genetic condition. This book is factual, scientific and easy to understand. Pair this with Clarissa’s own, honest journey and it makes the book easy to read, and very relatable. This book really helped when I first had my BRCA+ result and has continued to help as I refer to it throughout my journey. It has helped me to understand everything from the basic principles of genetics, to how I’m feeling personally about the whole diagnosis. I honestly couldn’t recommend this book highly enough. Thank you Clarissa for sharing your story and taking the time to produce such a wonderful resource for people facing such a difficult time. You would be be a very noble winner of such a prestigious prize. Thank you from my heart for this book Clarissa. Informative and empowering for women with BRCA gene mutations this book also is a great support for all facing hard choices. This book has really helped me through my journey and the hard decisions I’ve had to make. I’m so glad to have read this book. This book is absolutely fantastic and the only one of its kind. I felt comforted reading knowing that my thoughts and feelings were validated and normal. Clarissa has made my journey an easier one through reading her own experiences. Very delighted to have known this amazing lady and her loving family! I saw first hand how hard she worked on this book and how she’s inspired and educated women and men about this awful illness! Not only is this book amazing but so is Clarissa! As a BRCA2 mutant with breast CA, Clarissa’s book was so helpful in explaining simply and clearly how this mutation effects the risks for cancer. It’s an ongoing and invaluable resource for me. Clarissa Foster is a really inspirational women!! Informative, amazing book. It is very inspiring for others. 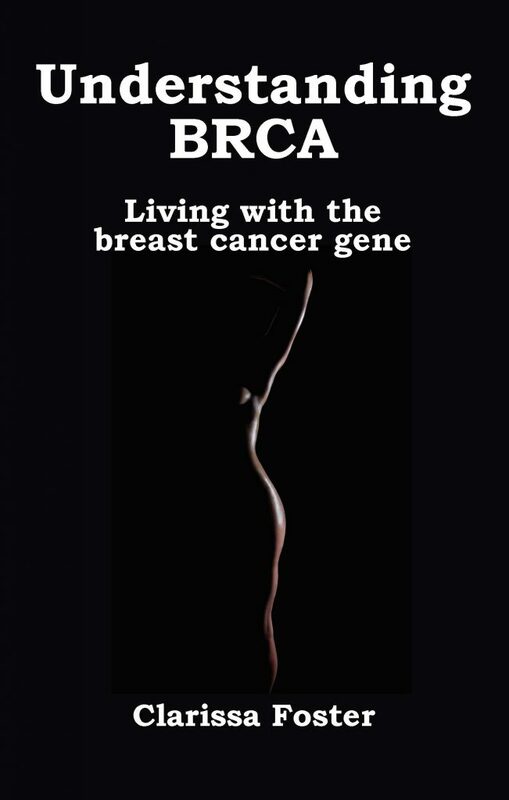 Factual, informative and heartwarming book to read from BRCA1 carrier point of view. Thank you Clarissa for sharing your personal journey. This is a very informative book! It helped me with a lot of questions I had and helped my family better understand the journey I was going through. Wonderful book about a truly amazing woman! I truly believe that this is the best book on the market re BRCA. There are many books available but many deal with an aspect of living with a BRCA mutation where as this book covers every possible aspect. Easy to read and well documented. I would definitely recommend it. As an advocate for those with BRCA and hereditary cancer syndromes kudos Clarissa for the time and effort you put into this excellent book! An absolutely wonderful resource. Best book out there on BRCA gene mutations:) amazing !!!! Having gone through the trauma of discovering that I carry the BRAC gene and that both of my daughters have it, as well, I am so glad that this book has been written! Thank you, Clarissa, for writing and sharing this much needed information!! Inspiring book. Thank you Clarissa for sharing your story. It certainly helped me in my journey for information. If you have the BRAC gene you should read this book. An absolute fantastic book,I’m brca2 positive and this book really helped me. Wonderful book and wonderful woman!! Congratulations!! I’ve heard of BRCA but didn’t realise how little information there is available. So this book is incredibly important for where we are now in our understanding. Information for BRCA and also the impact on people would be so valuable for anybody affected. Luckily, nobody I know has gone through this yet – but I know where I would turn to. I’ve read the first chapter and it’s clear that Clarissa has had to endure so much in her life and is using all of that experience for the good of others. You are amazing and I hope you realise that. Ordered the book and haven’t been able to put it down since it arrived on Monday. My Mother had a full masectomy at the age of 39. Years later, she had another recurrence with cancer of the ovaries. In 2011, her last bout of cancer, she developed a rare case of medullary thyroid cancer. She survived the surgery. An emergency trip to the OB/GYN prompted me to take the BRACA test in June. On June 13, I found out I carry the BRACA 2 gene mutation for breast cancer. Hoping to find answers to my questions, doubts and fears. This is a lot to absorb and digest. A book like this is helping me cope with my gene mutation and understanding important life decisions that will greatly impact my future health and well being. I’m more than half way through the book, very well written. I also like how she was so open about her moms battle with ovarian cancer. I hope everyone that is diagnosed with BRCA mutation will read it. Thank you Clarissa! This is an indispensable guidebook for those with the mutation as well as those curious about where the worlds of modern science and humanity intersect. Thank you for your important contribution to the community, Clarissa. I bought both the book and downloaded version so that I would never be without this incredible book. This book about understanding BRCA is incredibly insightful. I have been able to articulate my questions more thoughtfully instead of being in a panic. I suggested my to my gynecologist that this book would be a useful tool for any new patient facing these challenging times. This book becomes real when the author shares personal stories. It has helped me tremendously on my own continued journey. This is a wonderful, informative book written by a BRCA+ author who answers many question as well as offers honest personal accounts of her own experiences. After searching for this kind of book, I was very fortunate to have found it and will always be grateful to Clarissa Foster to have written it with as much of “her” as is possible. I rare gem for anyone enduring this difficult journey. I cannot recommend this book enough! It is an amazing resource that effectively sums up everything BRCA in one place. I particularly appreciated how Clarissa Foster shared the emotions she experienced along the way– they mirrored my own and made me feel stronger in knowing that I was not alone in feeling this way. I feel that this book could help friends and family better understand the emotions and tough decisions faced by those that have the BRCA mutation. Such a wonderful read and incredibly written by an incredible woman! Highly recommend! This is an excellent book, it will be valuable to anyone faced with trying to understand the issues and making the decision, and all the more meaningful being based on experience. I would also recommend the book to anyone in the health care professions who may be involved in advising or supporting people in these situations. I bought four copies of this book – one for myself, and the other copies for my 3 daughters – two of whom are BRCA1 – all in their early 30’s. Clarissa you deserve an award for this insightful and compassionate account of what it’s like to be diagnosed with this mutation. A very honest and gripping book. You feel like you take a journey through her experiences and opens your eyes to how difficult a journey like this can be. Being diagnosed on last stage in January 2010, I am grateful for all study material on BRCA, after reading Pub. Medic researches on LIGNANS and benefit of lignans how it stop hormone cancer including BRCA genetic mutation 1 and 2 I believe everything is possible, where as I have always been ok and using lignans every day. During a time when I felt there were few who understood, this book was a wonderful resource! A great resource for anyone who is BRCA positive and considering their options. Clarissa talks knowledgeably about her individual journey and uses her own extensive research combined with a personal experience to provide a comprehensive and sensitively written overview of the whole subject. A huge achievement which deserves reward. A resourceful book anyone with any connection with inherited cancer should read, patients, family members, friends, healthcare professionals. It takes special courage to share this experience with the world. I am grateful to Clarissa. Thank you! I’m BRCA1 and having endured breast cancer and chemotherapy prior to finding out I had the gene this book has been a godsend in understanding it all. Clarissa explains everything you need to know and more. She has been on an amazing journey and explains all so clearly. I have now completed my risk reducing surgery and keeping my fingers crossed. Well done Clarissa for achieving so much. I’m a brca2+ this book did not only help me, but helped other family members understand my journey and reasons behind my choices !!! As im the unlucky kid out of 6 of us. This book is easy to swallow and very informative!!! This book has helped me so much on my personal journey. Such an incredible woman to give the rest of the BRCA community some knowledge and courage around their choices. Excellent informative book that really helped me on my BRCA journey. This is a wonderful, easy to read book. I would highly recommend it. Your personal experience with the BRCA gene mutation encourages me to move forward with a PBM. The knowledge you provide is the indispensable information needed to make the final decision. Thank you for sharing your personal story as well as your immense knowledge. This book has helped me understand so much and I find myself going back to it many times throughout my journey with a BRCA mutation and the surgeries involved. Knowledge is power and I would highly recommend this book and have indeed to many of my family members. I will be ordering this book. Spoke to clarissa today. What a brave and wonderful lady. Quite a compelling read, great insights regarding the BRCA genetic mutation. This information is much needed and will help many, many women navigate the breast cancer landscape! Clarissa’s book is brilliantly researched and written. She is a wonderful lady and I hope her book gets the recognition it deserves! What a book ! I needed to read this at my time of diagnosis. Heart warming, honest and candid – Clarissa covered all info that I was looking for ! Job well done ! Really benefited from this book – it was very well researched and it was a huge benefit to me in making my surgery decisions and moving forward with my life . I’m glad Clarissa was able turn find a silver lining and help others with. BRCA gene .